shape American popular culture for the past four decades." I am a huge fan of the PBS (Public Broadcasting Service) series - American Masters ever since I saw their special on Billie Jean King. The two hour special really opened my eyes to what was happening during my high school years and how King - along with several other brave athletes - paved the way for women's tennis players to receive professional recognition and more favourable compensation at a time when women's sports was being side-lined. I now do a search every few weeks to see if any new episodes are available and occasionally watch old ones on their website (for non-US viewers you will have to jump a few hoops). 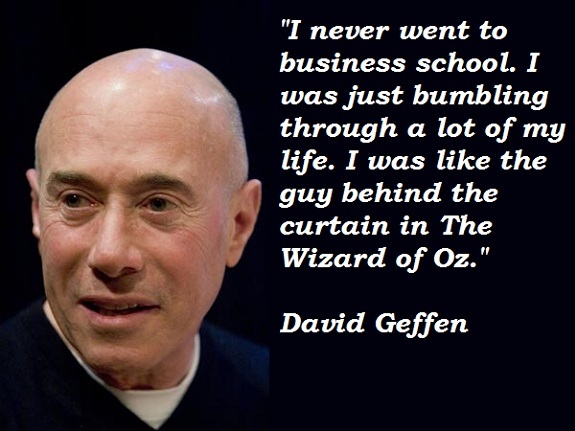 A few weeks ago I recorded Inventing David Geffen, which I just watched yesterday. Amazing! How did I never hear about this person before? He was intricately involved in building the career musicians I loved, producing stage productions I enjoyed and had his hand in creating movies I watched. No worries, I'm up to date now. However, after an internet search on his name, I found lots of detractors. As with other brilliant people I have pursued biographies on - they are passionate and focused, they do everything they can to bring success to a project that inspires them and you don't want to be on their bad side. They are equally driven when they feel wronged or threatened. So there it is. While I am sure there is some truth to the negatives, those who he promoted became financially successful. He did as well. 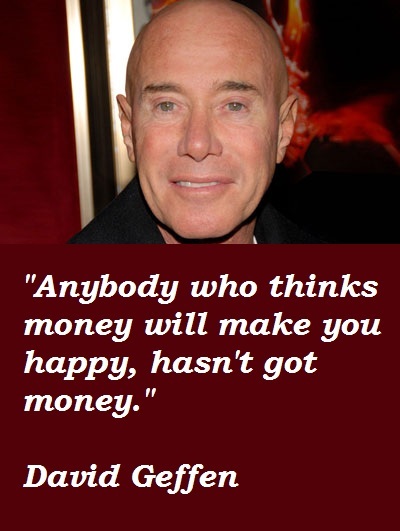 As one former client said, "David told me don't worry, he would make sure I made money. He would make more. And he did." One example is the Eagles. He told a soloist he should be in a band instead. The musician came back with a band and they spent two years in development until it started to pay off - becoming the Eagles. Geffen had some musicians living with him at times and always made sure those he took under his wings had their basic need were met. He championed them during recording sessions making sure their voices were heard. BUT he did hurt several clients feelings when he sold Asylum Records. 1. The Joni Mitchell song Free Man in Paris (in video below) is actually about David Geffen. 2. Although he defined himself as gay, he had a two year love relationship with Cher. 3. He is one of three founders of Dreamworks along with Steven Spielberg, Jeffrey Katzenberg and David Geffen. 5. Although from humble beginnings, his current estimated self worth is over $6 billion. - -$1 million to St. Jude’s Children’s Research Hospital and made numerous smaller donations to a variety of organizations that focus on AIDS and cancer, as well as various health clinics in the Los Angeles area. - -$450,000 over the years to two Atlanta schools, the historically black Morehouse College, and the all-women Spelman College, have received. --Smaller donations to organizations such as Read it LOUD. --$600,000 to Human Rights Watch has received at least $600,000 from Geffen. --Geffen supports a variety of organizations that provide services to Los Angeles’ homeless population. --$50,000 to the American Jewish Committee in Los Angeles. In closing, one thing he makes clear is that wealth does not bring happiness. When he hit the top, when his coffers were full, he decided chose to spend two years working with a therapist. He was not happy. Accepting who he was, including his sexual orientation, along with dealing with other struggles was important for him to come to the grounded place he is at today. "Since its premiere in 1986, this Emmy-winning documentary series has presented hundreds of hours comprising profiles of outstanding American cultural artists. Past subjects have included Charlie Chaplin, Helen Hayes, pop icon Andy Warhol, singer Billie Holliday and composer-conductor Leonard Bernstein."